The Gutenberg Research College (GRC), the central strategic instrument to promote top-level research at Johannes Gutenberg University Mainz (JGU), celebrates its tenth anniversary today. The GRC was established in 2007 during the first phase of the Excellence Initiative of the German federal and state governments. Together with the GTC and the GYR, founded in 2010 and 2014, respectively, it is one of now three expert bodies at JGU that promote research, teaching, and young academics. At the celebration to be held in the Mainz School of Music, the GRC will grant the 2017 Gutenberg Research Award worth EUR 10,000 to sociologist and anthropologist Professor Karin Knorr Cetina of the University of Chicago and will also welcome seven new fellows. Knorr Cetina is a pioneer of research in the field of the social sciences and has opened up new opportunities for innovative interdisciplinary research in recent years with her trailblazing empirical studies of the production of economic information by international financial markets. The new GRC fellows are outstanding academics and artists originating from JGU and elsewhere who will be provided with special support by the GRC to enable them to dedicate themselves to research and the arts at Mainz University. To date, the GRC has awarded 51 fellowships. Professor Christine Walde, Classical Philology, Johannes Gutenberg University Mainz. Professor Christine Walde and Professor Ulrich Breuer are the first recipients of the new 'Zielgerade'—or 'homestretch’—fellowships, which were instituted last year to facilitate the completion of large research or publication projects. For this kind of fellowship resources are made available to pay for teaching substitutes for the corresponding fellows over two to three semesters. "Our 'Zielgerade' concept shows that GRC fellowships can be flexibly adapted and tailored to the individual disciplines," said Professor Thomas Hieke, Director of the GRC and Professor of Old Testament Studies at JGU’s Faculty of Catholic Theology. "Over the ten years of its existence, the Gutenberg Research College has been an unmitigated success and has provided for exceptional expansion of targeted research support," added Hieke. 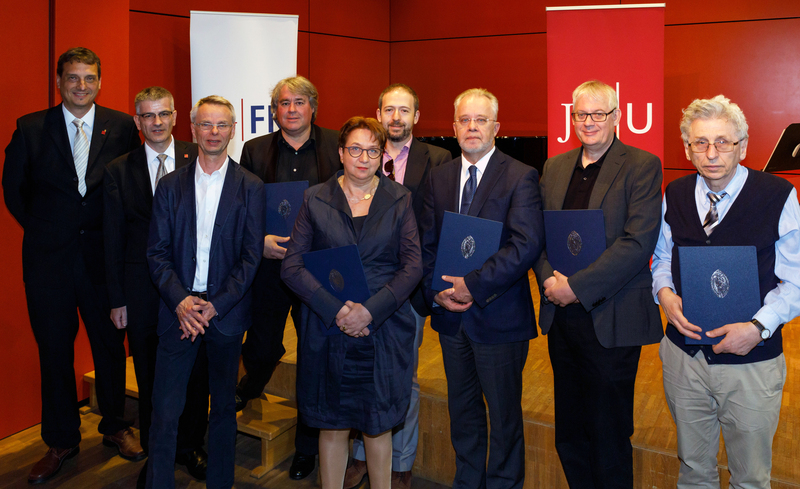 "The advice provided by the GRC executive committee has contributed significantly to the formation of JGU's research profile and the success of its proposals submitted within the Excellence Initiative of the German federal and state governments." The GRC executive committee consists of outstanding academics based at Mainz University and collaborating research institutions together with student representatives. It makes decisions on the awarding of GRC fellowships and advises the university administration and the faculties on aspects of strategy, such as the establishment of research units, the restructuring of institutes, and submissions to excellence competitions. As part of the tenth anniversary celebrations, the eminent English soprano Dame Emma Kirkby will be performing together with members of BAROCK VOKAL – The College For Early Music of the Mainz School of Music. This institute for excellence in music was established in 2010 by then GRC fellow Professor Claudia Eder. In only a few years it has established itself as an exceptional continuing education program for opera and concert singers as well as for advanced choral students.